Challenge; to cross-examine, demand, direct, enjoin, examine, give the third degree, go over, grill, hit, hunt for, inquire, institute, interrogate, investigate, needle, pick one's brains, pop the question, pry into, pump, put the screws to, put through the wringer, query, quiz, request, roast, sweat. Easy enough....quite possibly; but when it comes to design, nope not at all. This simple question of summing up your 'style' in one photo sounded like a quick, if not simple task. After 387 ridiculous photos later (or so it seemed), I still found it crippling to find just 1. But I gave it my all. I guess that's why I've moved plenty & have owned so many homes. I have more personalities than Showtime's Tara Gregson (United States of Tara). With each new home it allows me to change design personalities. Unlike Tara however, I don't have the pleasure of sharing my boudoir with Mr. John Corbett; all 6 ft. 5" of himmmmmm. It's a great style and room great mix of contemporary and classic . Yes, and in your case especially, good taste runs much deeper than the tip of the tongue ... it's to the bone ! LOVELY room you picked out ... I wouldn't expect anything less from you ! Gorgeous, Deb, gorgeous.... I love your style. You could replicate that room in the US or Scotland !! .... and, thanks so much for putting my giveaway on your sidebar. You are a wonderful friend....kind, and supportive. Thank you so much. I'm out of town, but now my mind is in deep thought on what I would choose...your highlights are all great and I'm agreeing with them all! Oh I'm still adrift in this challenge and no further forward - it's just as difficult as you describe. Your chosen room is lovely and intricate. I love your choice, Deb -- it's perfectly you! And I agree...this was a tough challenge! happy weekend to you love!! 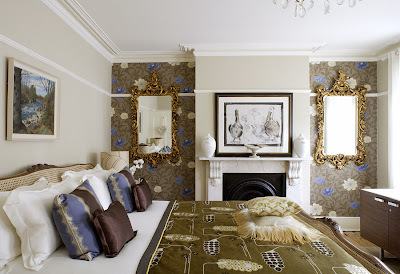 Fab taste Deb...adore the choice, I agree that traditional wallpaper can be applied in a contemporary style! Thanks for the visit Ms. D-T, mighty "wawm" here in Atlanta. It makes us southerners shift our metabolism into summer mode. Ms. Ally herself of FTLB was with us on the tour. I might have to choose a kitchen...a pastry kitchen to be exact..preferably someone elses. Just popped by to say thanks for the lovely comment on my blog. I am really looking forward to the meeting, and it is a shame that some of the great people I have met are so far away. We will take photos though and share our experience. love your choice of picture it does seem to capture your style. Absolutely beautiful. I love the details and think you nailed it! The wallpaper is gorgeous! What a challenge indeed! The image you chose is a stunner!!! You chose a lovely photo, Deb. This is a really difficult challenge, actually. I am very happy with my redo ( a sure sign of which is not changing things around much since I had it done)but then I love looking at shabby chic too. Hmmmm. Love your room choice... love those gilded mirrors and particularly love your colour palette.. Gee I would struggle I think to choose just one room.. maybe have to think about it, although right now packing boxes would sum it up perfectly!!! i like your style~~~!!! this is yummy! those mirrors are killer! this is a neat concept/challenge. i think i may have to partake. hmmmmmm....i can see how you would go through a lot of pics. kinda hard to nail down in one !? How to choose!? I'm with you, lovin' the white linens, texture, symmetry of the mirrors....this pic is a credit to your sophisticated style....lovely! Gasp! That photograph is beautiful...I have to say that the designer has a brilliant use of color. I'm very impressed. sum up MY style in one picture???? i would have to have at least two. and one for my EVIL TWIN. Great room, but I don't think I could do it... Too much of a chicken! Hi Deb, I love your selection. The room is just perfect! I always prefer my rooms to be a mix of antique with modern touches, be it the vases, a cool rug, funky chair...put I always need a mix. I never like sets or anything that looks like it all came from the same catalog/store. I'm all about wallcoverings now. We just painted antique chairs from the 1700's in red high gloss paint and I am over-the-moon happy with the outcome, they sit near walls covered in historic wallpaper with leopard fabric on the chairs and a modern lacquer table and of course gold mirrors. A complete mix which is really art when its all said and done.